Occasionally I’ll have a request for a Boss pedal to be modded to the point where components will no longer fit into the stock casing. Some people prefer the stompswitch rather than Boss’ switch design. 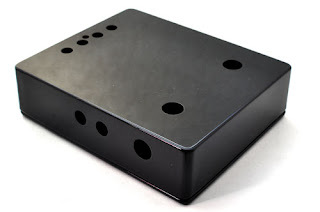 Sometimes we just want a discrete or unique looking pedal that doesn’t look like every other pedal out there. The predrilled casing pictured above allows for a quick turn around time. This one is for a Boss DD-5 which has the second large hole to accommodate a tap tempo footswitch. There is also room to add a reverse kill switch, a high cut switch (or even EQ knobs), and true bypass is certainly much easier in this format.